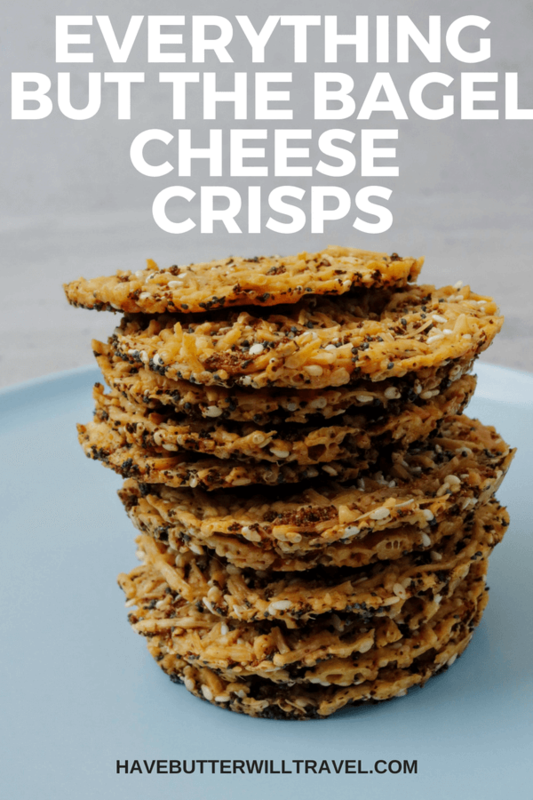 At 2g total carbs per serve these keto cheese crisps are a perfect low carb replacement for the traditional crisps and crackers you would serve with dips. We have served these to family and friends on a keto grazing platter and they are always the first to go. Everyone always loves them. 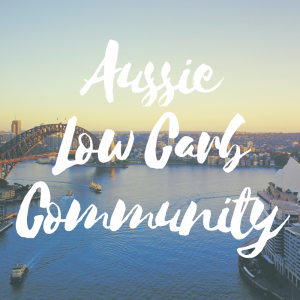 Our favourite thing about this, is we can enjoy them as well. 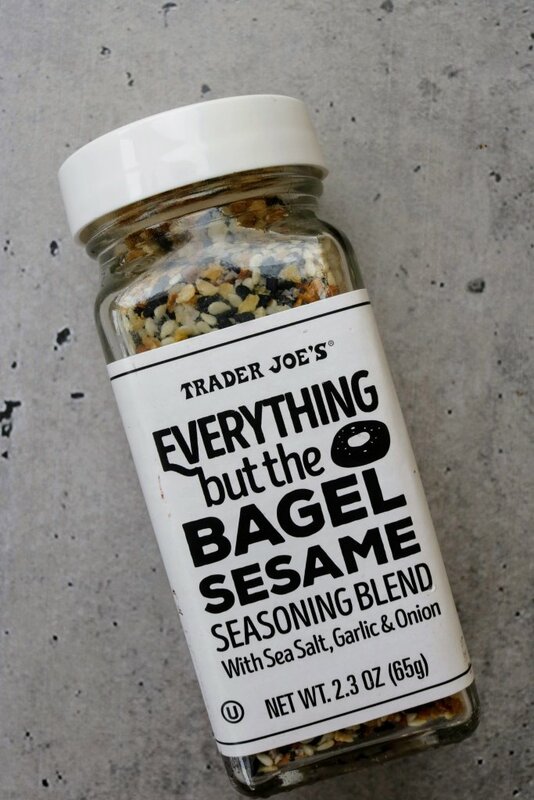 We have seen lots of our American friends enjoying their ‘Everything but the Bagel Seasoning’ from Trader Joes and we have always wanted to try it. When we travelled to the US in 2017 we headed to a Trader Joes in San Francisco to stock up. 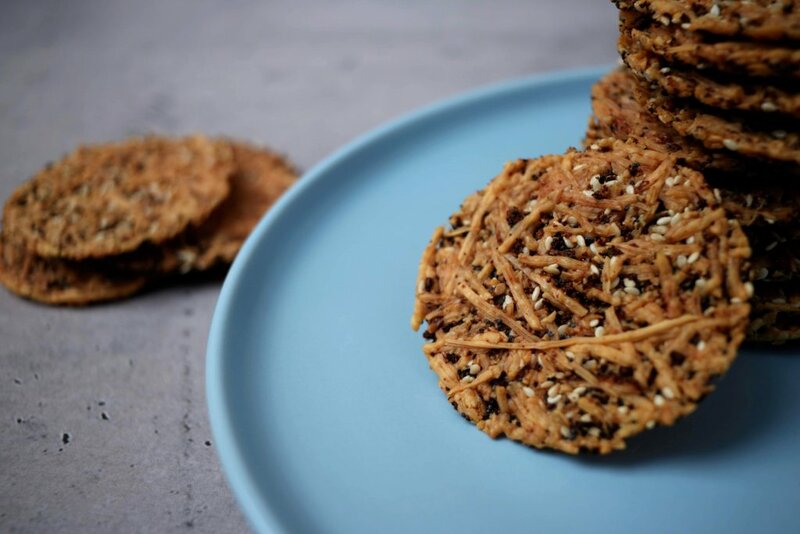 It is a combination of poppy seeds, sesame seeds, garlic, onion and salt. Dan loves to add it to her fried eggs in the morning and we even needed to get a friend to bring us back some more when she went to the US earlier this year. But don’t worry you don’t need to go to Trader Joes to make this recipe! 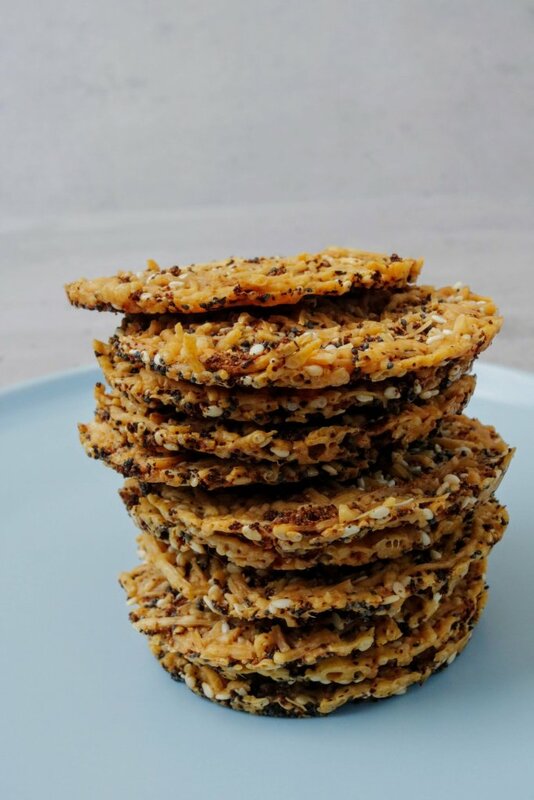 We have used similar ingredients of the Trader Joe’s everything but the bagel seasoning to create these moreish keto cheese crisps. We have made our own cheese crisps for awhile now. We usually use cheddar cheese slices, but when we were in Hawaii, we saw Wholefoods had parmesan crisps and we decided to try them. They were flavoured with everything but the bagel seasoning and super delicious, but also very expensive. 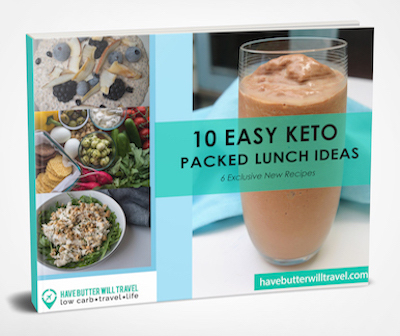 Check out our Hawaii vlog where we visited Wholefoods for more great keto finds. We loved them so much that we wanted to try and recreate them once we came home. Guess what, they worked out so great that we wanted to share them with you. 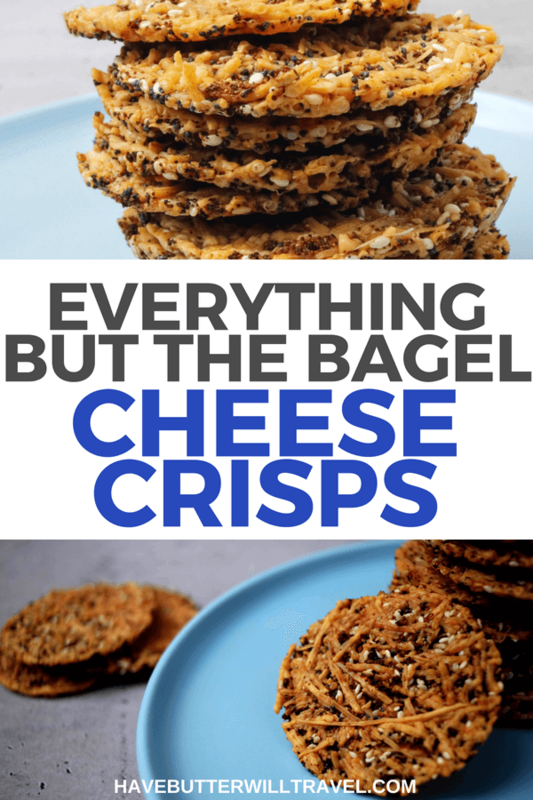 The everything but the bagel seasoning ingredients adds extra flavour to an already delicious keto cheese crisp. You can use different types of cheeses. We have made them with parmesan and cheddar. We have found the harder cheeses work better as they are less oily. Our preference for these crisps now is parmesan cheese as we love the flavour and they tend to make a great crunchy crisp. Feel free to experiment with different types of cheese and see what works the best for your palette and preferred texture. We found using a silicon muffin mould worked really well. The muffin moulds result in a perfect circle shaped crisp. If you don’t have a silicon muffin mould, you could use a regular muffin tin or just line a baking sheet with parchment paper and shape the crackers onto the tray. Don’t add additional salt as the parmesan is already salty. Try to spread the mixture evenly in the tins. It will result in a crispier crisp and it will also look prettier. Try to use about a tablespoon of mixture for each one as that ensure that they aren’t too thick. These are a great snack on their own. Serve with keto dips including keto ranch dip, keto basil pesto and keto guacamole. 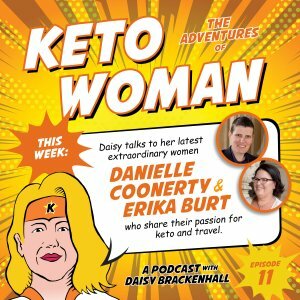 We would love to hear what you think about our keto cheese crisps. What is your favourite thing to serve them with? Makes 12 Crisps. A serving size is 3 crisps. One of the easiest and tastiest recipes I’ve ever tried! Had no poppy seeds for the first batch, so added a 1/4 tsp of Dukkah…amazing flavour. No store brought crackers from now on! Thanks ! Glad you liked them, Lynn. Definitely much cheaper than the store bought ones. That’s for sure. Just wanted to add, take note of the carbs in the Dukkah. I looked at the original one I used & it had 6 carbs per tbsp (sounds alot really? )…that was given to a friend, and I have now found one that has .8 per tbsp now! Hi, y’all, I’m going to crank some of these out. I actually have the Trader Joe’s seasoning on hand. 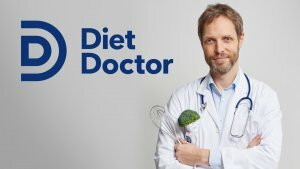 Do you have an idea for how to use since I will not be measuring out the individual ingredients? Thanks! Hi, The ingredients we used added up to 1 tbsp and 2 tsp. So, I would just add 1tbsp and 2tsp of EBTB seasoning you have. Holy cow, these are delicious! Doesn’t get much easier than this. I used a combo of cheddar/monterrey cheese and pepperjack. Fabulous snack! Thanks Katie, That cheese combo sounds delicious. We need to make these again soon. They are so good. Just made a big batch for Christmas nibbles and put some rosemary in the mix. Very tasty! So easy and I get to enjoy them as well as the guests! Thanks for your nice comments. I like the thought of some rosemary in there. Everyone will love these at Christmas.